Imagine a book that can help you develop the relationship with your children by using something you can an endless supply of: love. 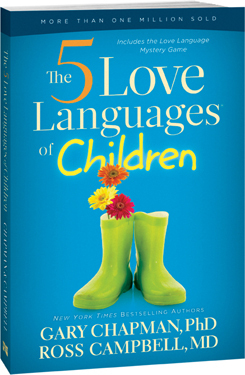 The basic tools offered in The 5 Love Languages of Children will help parents to better understand what kind of love and affection to give their child. All children want and desire love. The 5 Love Languages of Children suggests that at any given time, your child is desiring and will respond better to a specific type of love. As parents, understanding these different types will better your child's attitude, behavior, and development. 1. Physical Touch: remembering to give that good night hug, or even just a hand squeeze in the car. 2. Words of Affirmation: more than just saying "I love you," although that is very important in itself. Encouragement and praise for an act in which your child has control over. "Nice job on your science test!" and "I really liked how you were sharing with your sister." Reminding your child how much they mean to you. 3. Quality Time: being present with your child when they need your attention. When they have something to tell or show you, stop and give them your attention. Ask about the events of their day. Include them in your chores, such as cooking, and use this time to talk to them. 4. Gifts. Children who have the giving and receiving of gifts as their love language often rely on other love languages to help "keep them full." If gift-giving is given alone, then it can become empty and meaningless. If given with other love languages, it can become a powerful expression of love, both at the present time and for years to come. 5. Acts of Service. The traits of this one overlap with Quality Time, but have a much more "helping" aspect. Helping your child when they are frustrated or lending a hand when they are overwhelmed with chores. Not doing the work for them, setting an example that service to others is desirable. Even something as simple as following through on a birthday tradition can be an act of service in a child's love language. When I began reading this book, I was hoping that I would be able to pinpoint the exact love language each of my five children needed. From there I imagined my whole life would be changed for the better. The house would be clean, schoolwork completed, magical fairies would appear to give me more time to sew. Well, that was wishful thinking. If anything, knowing these traits made it harder on me. None of my children fit just one language. Some are two, others are three, some are four all at the same time Some were one specific trait and now are not, but does that mean they could change back? Of course it does! They're kids. They change so much each day it's like running a never-ending marathon. With my eyes closed. The best thing about this book, for me at least, was it affirmed for me that I was doing the right thing for my kids. With five of them I don't have time to snuggle endlessly with each one individually. Most of them don't want that and I thought it was something I had done or said to make them this way. As a child all I wanted was hugs and kisses from my mama. But I realize that as they get older, they want less hugs and more Quality Time or Acts of Service. The older boys really love to gift me with paper airplane and cut-out snowflakes. Or tell me about a complicated maze-drawing. But just a peck on the cheek mom because we are tooooo busy for that kind of loving right now. The 5 Love Languages of Children is available on amazon for only $14.99. I am also able to give one of my blog readers a free copy of the book. Simply leave a comment below letting my know how to contact you and I will choose one lucky reader on April 12. Good Luck! I've enjoyed other books in the 5 Languages series and would love to add this to my reading collection. Thanks for honest review and giveaway. I have an older version of this book and would love an updated copy. I will be writing about it for the five day blog hop coming up in May on the Crew.